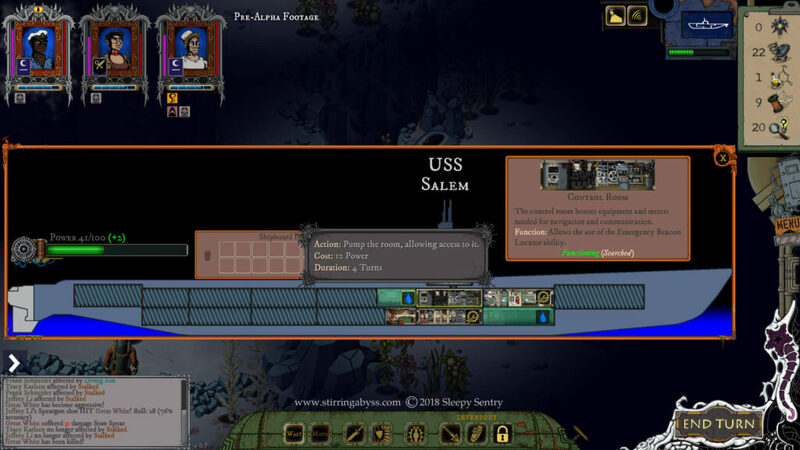 Exploring the depths of the Atlantic ocean in a disturbing atmosphere in this promising turn-based tactical RPG. Let’s talk about Stirring Abyss by Sleepy Sentry. After having tested the alpha demo for a few hours, I can say that we are facing a title that can become a small masterpiece. Here is my overview of the game. We are in 1958 and Russian intelligence has got its hands on some documents that indicate the presence of something unusual in the depths of the Atlantic. Thus the Soviets begin their research. The United States not to be caught unprepared, recruit the best submariners and scientists who thank the use of the submarine SALEM, Gato-class submarine and veteran of WW2, will go to investigate the seabed. 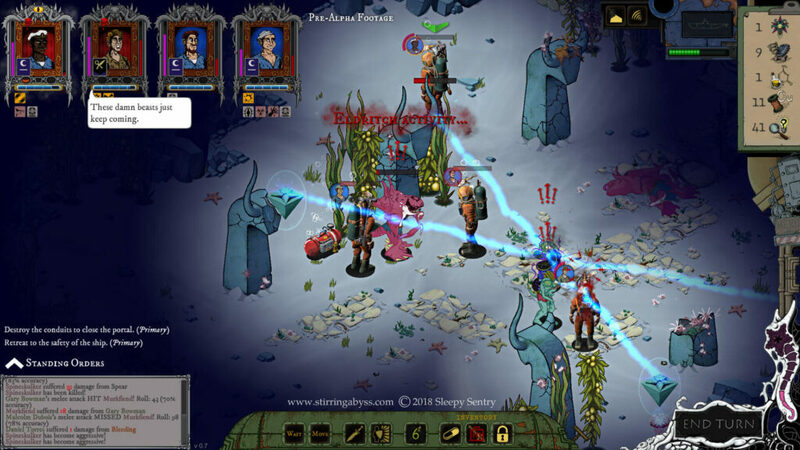 Stirring Abyss presents itself as a turn-based strategy RPG game, where we will control several sailors, each with their own characteristics, traits, and skills. We will move in turns, each soldier has his own action points that he can use to move, attack and use special abilities. During the exploration phase, we will have to pay attention to the air level of our soldiers that must never reach zero. When we meet the seabed creatures (Lovecraftian monsters) we will alternate our turn with theirs. Each creature has its own special abilities and weaknesses, so we will always have to deal with them in a certain way. In Stirring Abyss we will have to repair our submarine, emptying the rooms from the water and repairing the internal equipment, doing so we can access new rooms, and unlock new skills and tools such as the sonar that will allow us to reach other sailors dispersed on the seabed. To do this we will need resources that we will find during our explorations. During the course of the adventure, we will have to make difficult decisions that will change the events and will have consequences on our crew. These events could be of a different nature and also thanks to the traits of our soldiers we could have different options to choose from. Unlock new levels and choose where you will explore next. Sleepy Sentry was formed a few years ago by three guys from Turku, Finland. They started off making mobile games as side projects while studying. After graduating from the University of Turku they decided to get serious and started work on Stirring Abyss. 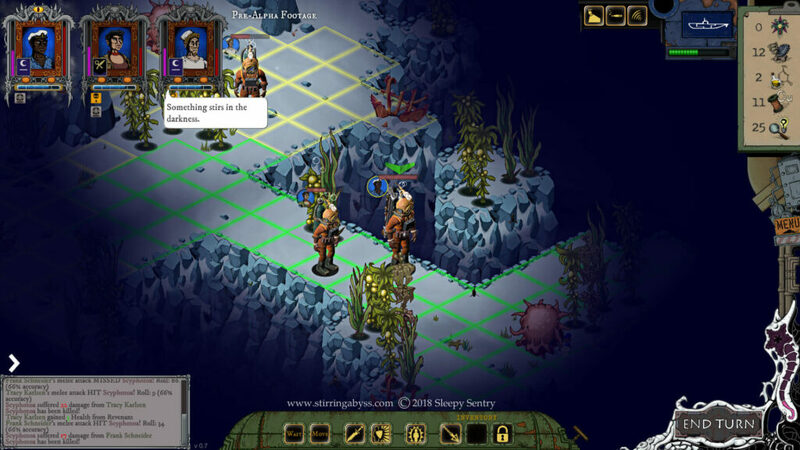 The turn-based game by Sleepy Sentry is still under development, and an Indiegogo fundraising is in progress. The release date is scheduled for 2020 for PC. If you have also tried Stirring Abyss, share your impressions with me, using the comments below or via Twitter. In the meantime, take a look at other interesting turn-based games.